Consumption of virgin olive oil as a seasoning or during cooking is increasing worldwide mainly due to its nutritional benefits. However, research suggests that cooking with this heart-friendly oil can degrade its quality depending on the cooking time and the heat which, ultimately, leads to a waste of money. The benefits of olive oil come from the high concentration of monounsaturated fatty acids, which make up about 70 to 80 % of the oil's total fat content. Extra-virgin and virgin olive oil is obtained by crushing olives into a mash, which is then pressed to obtain the oil using the cold-pressed (without the use of heat) method. In comparison to other vegetable oils, obtained by solvent extraction and other refining processes, virgin olive oil retains the original fruit components and so it has other phenolic compounds, pigments, and volatile compounds as well. Other than its high monounsaturated fat content, it is the presence of these minor compounds and its potential bioactivity which adds to the value of the extra-virgin olive oil. One of the main things to make note of when evaluating whether it is fine to heat any oil is to consider the smoke point of the oil. Smoke point is the temperature at which visible gaseous vapors arise and the oil begins to degrade. Chemical changes occur in the oil which reduces its nutritional value and also leads to the formation of harmful cancer forming compounds. Hence oil should not be heated till it reaches the smoke point. In general the more refined the oil, higher its smoke point will be. A higher smoke point means that it can be heated to higher temperatures. Olive oil has a low smoke point (around 375°F) compared to other vegetable oils. Extra virgin olive oil has an even lower smoke point as it cold-pressed and does not undergo refining at all. As a result, olive oil's key phenols, which work as antioxidants to preserve heart health, begin to degrade at high heats. When virgin olive oil is heated to a high temperature, such as during cooking, it loses its additional nutritive value as the compounds get oxidized and health benefits move down to the level of what other oils may already be able to provide. 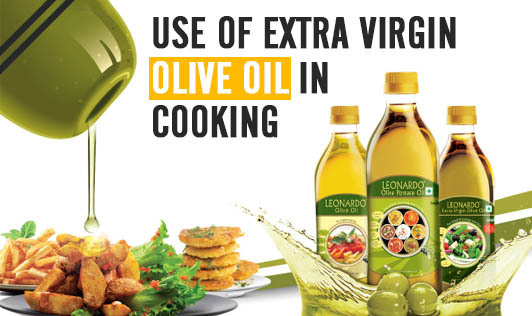 Olive oil compared to other cooking oils is heavier on the pocket and so it is economically better to use other cost-effective oils for cooking and use extra-virgin olive oil only for salad dressing and dishes that do not require high temperature cooking.